Find out about the upcoming live-action Static Shock show. While Marvel is basking in the glory of it's upcoming Netflix series based on Daredevil, Luke Cage, Jessica Jones, Iron Fist and The Defenders, DC has launched their own short-form digital platform. Variety reports that the newly named "Blue Ribbon Content" division will launch original programs and new shows from Warner Bros. Entertainment’s "collection of intellectual property." 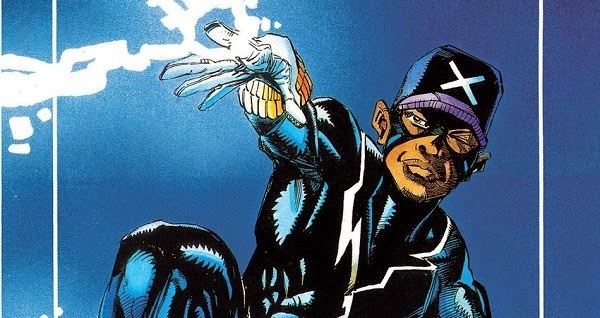 One of the first properties announced is a live-action series based on co-creator Dwayne McDuffie's Milestone comic character Static (also known as Shock Shock). Virgil Hawkins is a teenager who gets electrical powers in an accident and becomes a superhero while fighting the struggles of all young black men. It sounds a lot like Spider-Man, but very different. "Like any other awkward 15 year-old, Virgil Hawkins worries about pocket money, getting beaten up, and drugs." Dwayne McDuffie said, "But recently, he's had even more on his mind: stuff like his powers, his secret identity, and drugs. Because, when innocents are in danger, and Virgil can slip away from class, the geeky youth becomes Static, the dashing, adventurous superhero!" While the character has a successful animated series, named Static Shock, this is the first time he's appeared in live-action. Writer/producer/director Reginald Hudlin (Best Picture Oscar® nominee for producing Django Unchained, writer/director of House Party, executive producer/director of acclaimed TV series The Bernie Mac Show) leads the creative team behind a live-action adaptation of Static Shock, featuring the African-American super hero Static, aka Virgil Ovid Hawkins. Static Shock is based on the Static comic co-created by the late Dwayne McDuffie with co-writer Robert L. Washington III and artist John Paul Leon, which was originally published by the DC Comics imprint Milestone Comics and, later, by DC Comics. Milestone Media co-founder/comic book artist/TV producer Denys Cowan (the original Static Shock animated series) is collaborating with Hudlin on the new Static Shock. The aforementioned animated version of Static Shock previously aired for four seasons during the Saturday morning Kids’ WB! programming block on The WB Network from 2000–2004.. This animated shortform series from Bruce Timm and Alan Burnett (producers of the legendary Batman: The Animated Series) will debut on Machinima in 2015. The series is based on Justice League: Gods & Monsters, an original animated film executive produced by Timm and co-produced by Burnett that will be released by Warner Bros. Home Entertainment later in 2015. Chronicles explores a newly conceived reality in the DC Universe where Justice League members Superman, Batman and Wonder Woman are much darker versions of the Super Heroes that people think they know. The next generation in the Mortal Kombat franchise to be released in association with the upcoming “Mortal Kombat X” videogame, slated to bow April 14, 2015. Blue Ribbon Content and Warner Bros. Interactive Entertainment are teaming on the series, which will showcase some of the franchise’s popular characters and introduce a new generation of fighters. Another surprising announcement is a series based on the old Gremlins knock-off Critters, which I always enjoyed. Series based on the New Line Cinema cult classic movie franchise, with a new batch of alien pests descending on the planet. Written by Michael Jelenic and Aaron Horvath (“Teen Titans Go!”). There's also a virtual-reality entertainment experience called “Batman: The Animated Series Experience” where people can explore the Batcave. This is very exciting news and I'm sure if McDuffie were alive today he'd be overjoyed to see how his character is coming to life. Are you looking forward to a live-action Static Shock series? What about Mortal Kombat and Justice League? Do you remember Critters? What DC character would you like to have they're own series? Which DC character? Any of them at this point. Be curious how well it will do on the WB when Marvel is placing theirs on NetFlix. Bruce Timm!!! I want a shot at going in the Batcave, I don't care if it is virtual. This is awesome. And your brief description of the character also makes it clear that Static was the original version of the new Ms. Marvel. Maybe he'll get another comic book out of it, too. I still want to read the art-heavy Scott McDaniel one (I'm a big McDaniel fan), but maybe that one was presented the wrong way after all. This is a character who deserves to be exactly what he is, a role that Ms. Marvel and the Miles Morales Spider-Man have usurped in his absence. The whole points of this topic are a fantastic execution to put in the useful usage. Best for learning and adapting!